Harcourt Children's Books, 9780152059927, 32pp. Alice is wide, wide awake. Mama brings flowers, tea, a quilt, even lullaby bells to help her sleep. But none of these things are blue, and Alice can sleep only in a blue room. Yet when the light goes out, a bit of magic is stirred up. Pale blue moonlight swirls into her bedroom window. Then the night swirls out, around the moon and into the universe, leaving Alice fast alseep in a most celestial blue room. 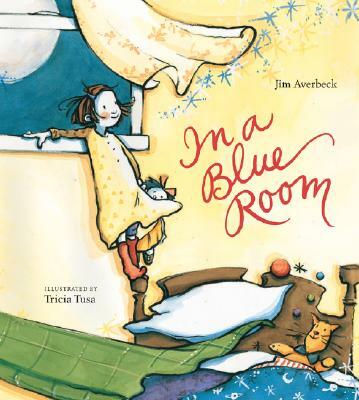 "This dreamy bedtime book doesn't have a single unnecessary word. . . . Tusa's illustrations, done in ink, watercolor, and gouache, show a child progressing from Pippi Longstocking-like energy, through acceptance, drowsiness, and finally sleep. Their soft colors and simple lines are perfectly suited to the simplicity of the language. This lovely book works well as a one-on-one bedtime read, but it would also be the perfect final selection for a pajama storytime."